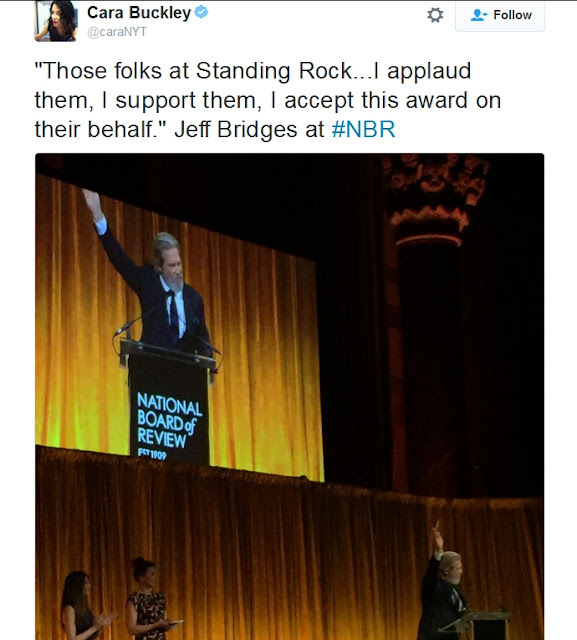 At the National Board of Review Awards on Wednesday, actor Jeff Bridges accepted his best supporting actor award in honor of water protectors at Standing Rock. "I also want to thank all those folks at Standing Rock, and all those people supporting them. The movie deals with the consequences of looking out only for your own self-interest, what that costs not just to you, but everybody." "And those folks at Standing Rock, they're looking out not only for their own interests, but for all of our interests, making sure we live on a healthy planet. I support them, I applaud them, and I accept this award on their behalf." Bridges received the award for his work as Texas ranger Marcus Hamilton in the neo-Western film Hell or High Water, in which he tracks down two brothers who are robbing banks that are forcing them to foreclose on their property. Bridges' tribute to Standing Rock is also similar to Marlon Brando's 1973 Oscar win for best actor in The Godfather. When Brando was declared the winner of the Academy Award, Native American activist Sacheen Littlefeather walked up to the stage in traditional clothing and announced that the actor "very regretfully cannot accept this very generous award" due to the film industry's and the country's mistreatment of her community. More than four decades later, Bridges used his celebrity and platform to stand up for the rights of the Native American people. 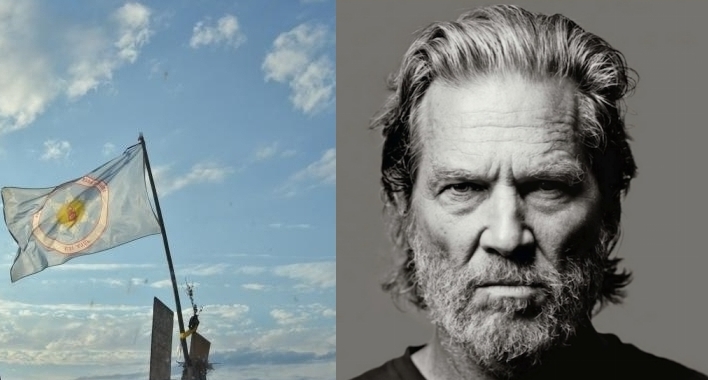 Responses to "Jeff Bridges Accepts National Board of Review Award in Honor of Standing Rock"
Bravo, Jeff! Well done in your career and in support for the Standing Rock stand-off.